“Straight teeth actually age better!” Why? If your teeth are crowded they are more susceptible to wear and tear (from collisions top to bottom), gum disease and tooth decay (bacteria having places to hide). In addition, people with straighter teeth and a more confident smile have been shown to live longer. There are two ideal options for your path to straighter teeth: Clear aligners (commonly known as Invisalign), and brackets and wires (traditionally known as braces). Dr. Bown is not an orthodontist but has taken numerous courses in straightening teeth using both of these. Dr. Bown is also a Premier Provider of Invisalign, a status that is only received by doing a large number of cases annually. Invisalign is a series of clear plastic trays that are custom designed and fitted for you in order to move your teeth efficiently and effectively without the world knowing. They are also perfect for oral hygiene as you can take them out to eat and brush and floss. 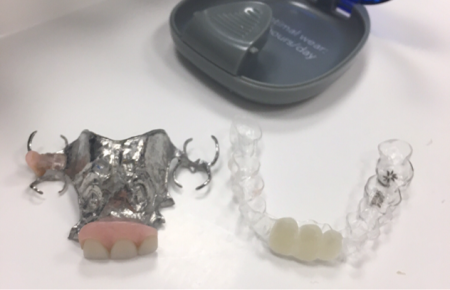 Most aligner changes have no negative feeling when you put them in for the first time. You do need to wear them up to 22 hours per day but some patients can change their aligners as often as every 5 days up to 10 days depending on the acceleration products used or commitment to wear time. 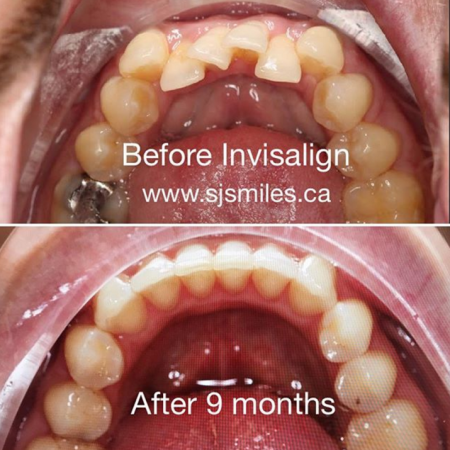 Dr. Bown has also done a number of cases where the patient is currently wearing a partial and the Invisalign serves as a tooth replacement appliance while having their teeth straightened (see bottom right photo).